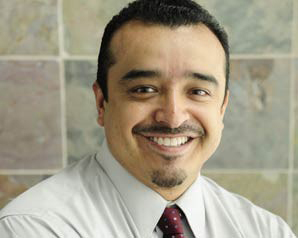 Rudy López is the newly appointed Executive Director of Interfaith Worker Justice. Born and raised in East Chicago, Indiana, he grew up with a migrant farmworker father who was a union member at Inland Steel Co. and an immigrant mother from Mexico. Mr. López studied political science at Indiana University and is an active member of Our Lady of Guadalupe Catholic Church. Mr. López has extensive experience in community organizing and legislative advocacy on behalf of immigrants and workers. As Political Director for the Center for Community Change (2007-2013), he worked with groups nationally to register, educate and turn-out hundreds of thousands of voters in low-income communities and communities of color. He previously served as Wellstone Action’s National Field Director (2005-07), training grassroots leaders to manage campaigns and run for political office, and was the National Field Director of the Chicago-based U.S. Hispanic Leadership Institute (2000-05) where he oversaw Latino leadership development programs and voter-registration drives. His first experience came in the immigrant neighborhoods of Pilsen and Little Village in Chicago, where he worked as a community organizer with Gamaliel affiliate the Metropolitan Alliance of Congregations (1998-99). For the last two years, prior to assuming his current job, Mr. López worked for comprehensive immigration reform as a senior organizer for the Fair Immigration Reform Movement (FIRM) based in Washington, D.C. He was one of the core fasters for Fast4Families, touring the country to raise awareness about immigration reform. He is a frequent media guest focusing on issues of social justice and active community engagement. On Ash Wednesday, Feb. 18, Interfaith Worker Justice will launch a “Fast from Fast Food” for Lent, raising awareness about the needs of low-income workers in the fast food industry. I interviewed Mr. López by email about his new job and this project on Feb. 10. What is Interfaith Worker Justice (IWJ) and what does it do? IWJ is a national non-profit organization dedicated to advancing the rights of low-wage workers by engaging diverse faith communities in action, from grassroots organizing to shaping public policy at the local, state and national levels. We work on efforts to secure paid sick days and maternity leave, keep Wal-Mart accountable and support the Fight for $15 an hour. We also lead the way on wage theft and on an effort called Paystubs for All. We organize, educate and advocate for a just and fair economy where an honest day’s work deserves an honest day’s pay. We do this through a network of more than 50 interfaith groups and worker centers, along with thousands of individuals throughout the country. How did you become Executive Director? I had been involved in civic engagement and community organizing for most of my career. One of the great parts of my past positions is that I would get to work on the ground level in communities all across the country. Although my Catholic faith has always been a deeply important part of my life, most of my work was not connected to faith-based organizations. What I found was that when my work did intersect with my faith, it was then I felt most alive. After some time of discernment I decided that I needed to pursue my calling and focus on the intersection of faith and community organizing. Fast4Families was an important experience as it really cemented for me the power of bringing people together around a set of values and beliefs centered through prayer. I then went on a four-month sabbatical and during part of it I walked the Camino de Santiago in Spain. It was an amazing experience and it helped me to spend a lot of time in prayer and reflection. It was soon after I returned from sabbatical that I received a call from a dear friend that encouraged me to seek out the position at IWJ. After more prayers and discernment, it became more and more clear that IWJ was where I was called to be. What changes do you hope to bring to Interfaith Worker Justice and its projects? One of the great benefits about coming into this position is that IWJ has 18 years of good work to its name. As I mentioned earlier, we most recently have been involved in securing paid sick days and maternity leave, keeping Wal-Mart accountable, the Fight for $15 an hour and leading the way on Wage Theft and pay transparency through Paystubs for All. I’d like to build on that strong foundation and at the same time drive our work toward one converging point. We are in the process of determining what that is, but for now I can tell you that we are looking at ways to deepen our work with congregations and worker centers as well as expand our reach with youth. I also see great opportunity to use civic engagement as a tool, as I’ve seen the importance of people getting directly involved in the beauty of democracy. What are your long-term goals in this job? I think our greatest contribution over time is helping to shape how low-wage workers are perceived. All levels of work should be viewed with dignity and respect. We have a class problem in our country. Status, income, education, gender and race are too often the measure by which we judge each other. The lower the pay, the lower the respect for the job and consequently for that person. That isn’t right. God wants us to be free from that type of judgment and look deeper to see the value in each person and, as a result, in his or her work. At IWJ we want to shift this perception because it’s the key to getting fair and just legislation, working conditions, benefits and pay. We have to change hearts and minds, touching people’s souls in order to make a difference that will last. In your work, who are your role models in the Catholic faith, living or dead? I’ve been blessed to have great role models. My mother has been my primary role model because of her deep dedication to her faith and commitment to her family. Although I know she has struggled, I’ve never seen her waver and she is stronger in her faith today more than ever. At one point early on she wanted to be a nun, but she couldn’t go to the convent because her father became ill and she became the primary breadwinner for the family. She had me praying the rosary at eight years old and encouraged me to become an altar boy. My mother has been a constant source of agitation and support to my faith. Other role models include people who not only stood up for what they believed in, but also took risks to shape a world that reflected their faith and values. People like Cesar Chavez, Gandhi and Dr. King. None of them were perfect by any means, but the greatness of God is that he works through even the most imperfect of us to do great and amazing things. Just look at the lives of many of our saints. As Catholics we are blessed to have a rich abundance of role models to choose from: our saints and/or those who are in the process of becoming saints. I really admire Blessed Miguel Pro and all those who gave their life during the Cristero War in Mexico. Mother Teresa is such a model for me, not just because of what she did for the poor, but the fact that she did so even during the most challenging moments of doubt and darkness. In spite of the spiritual dryness she faced over and over, she still moved forward. As we know, Pope Benedict is one of the great spiritual intellectuals of at least the past 100 years. I admire the depth of his understanding of our faith and ability to communicate it. Pope Francis is a great inspiration to me too. We have such a treasure in our pope and he has given me more confidence to charge forward with what I believe in as he has shown by his own example. I also have profound respect for Archbishop Oscar Romero, for rising up to the moment that he was in and showing courage in the face of his own death. And I would be remiss not to mention St. Ignatius of Loyola — and not just because this is a Jesuit magazine! He is an amazing example of commitment to deep prayer and reflection and his Spiritual Exercises are a beautiful gift to us all. He was fiercely dedicated . How has your faith changed or evolved over the years of your work in social justice? My faith is what makes social justice make sense to me. Over the past 19 years in the movement, both my faith and commitment to social justice have grown and deepened. The two correspond and relate to one another because at its core, social justice stems from values which are rooted in our Catholic faith. Fairness, compassion, courage, solidarity, respect, dignity, and love, among others, are all values grounded on faith and social justice. What has changed is how I share and talk about my faith. From something I once practiced privately, my faith has now become part of what defines me publicly. I have made a choice to have my faith lead the way as I do social justice, and it feels great! God has blessed me with many wonderful people, experiences and tools to strengthen my prayer life both individually and communally. The sacraments are one of his greatest gifts that he has left us to deepen our prayer life. They are the pillars of any strong Catholic prayer life. I try to get to daily Mass and I have begun more regular Eucharistic adoration, which has been very fulfilling. I find the Lord’s promises in the Divine Mercy Chaplet deeply comforting and powerful, which is why I pray it daily. I pray the rosary and a few novenas a year, especially during Christmas time. I have a strong devotion to our Lady. The Virgen de Guadalupe and the Virgen de San Juan de los Lagos are particularly important to me. Pilgrimages have also become a big part of my prayer life. I do a yearly pilgrimage to San Juan de los Lagos in Mexico where we walk for five days. As I mentioned earlier, Camino de Santiago was an incredible experience. I have come to have a deep respect for the power of fasting and I practice fasting several times a year. You grew up as part of a working-class immigrant family in East Chicago, Ind., where your mother is a faithful Catholic and your father was a union worker at Inland Steel. How did that background make you who you are today? It had a profound impact. It’s a core part of what makes me who I am. Seeing my mother manifest her love for our Lord, our Blessed Mother and the church in everything she does has been a wonderful example to me. She has lived her life in a way that has shown me the power of humility and tenacity. My father has a work ethic like no other. He respected and loved his work in the mill and was always for having a job that allowed him to provide a good life for his family. He understood the role and the value of labor unions. Even though he didn’t know the word "solidarity," he modeled it for me and always told me to stand up for myself and for others. Learning from his example, I gained the confidence to speak up without fear and to honor the commitments we make. East Chicago had in important impact as well. We were a close-knit community and we looked out for one another. The Church, union and schools played an important part in our daily life. Some of my fondest memories have come from the time I spent in each of those places. How does Catholicism influence your approach to interfaith partnerships in your work? My Catholic faith has been very instructive from a values standpoint, but also through the example I’ve received from our recent Holy Fathers Pope John Paul II, Pope Benedict XVI and now Pope Francis. Each one to varying degrees has spoken about and practiced the importance of reaching across faith traditions to find common ground in the love of God. We are Catholic and the core of who we are should always remain so. And we should use the beauty and strength of our faith to build bridges where we can join together with other brothers and sisters to increase the glory of God. That’s not always going to be easy and I believe it’s one of the reasons why it’s so needed. All major faith traditions stem from the same two commandments that our Lord and Savior gave us himself: Love God above all and love our neighbors as ourselves. I believe if we focus on that, we’ll realize we have much more that connects us than separates us. Some Catholics find it hard to work long-term in social justice without succumbing to burnout and disillusionment about effecting change. What keeps you going and sustains you in the work? I really appreciate that question because it’s an important one for everyone to consider. It’s a marathon, not a sprint, so we need to plan and practice sustainability and rejuvenation. Scripture keeps me inspired and grounded, but so does being with the people on the ground who are most affected. I also like to win. "Win" not just in the sense of a legislative campaign, but of knowing that we are moving the dial forward. When I see our grassroots leaders lift up their own power, when I see hearts and minds shift and change, we win. When I see justice prevail even in what may seem small, yet still significant ways, we win. I am also really intentional about a work and life balance. I make time for the things important in my life. I make time for fun. I make time for friends. Maybe not as much as I would like, but I take time to do things that fill me outside of the work. I love to travel and that gives me additional perspective and motivation. I was in Turkey last year and was taken aback by how much Catholicism is part of the Turkish DNA. No doubt it’s a Muslim country, but the history of our church is imbedded there from the evangelization that St. Paul lead to the home of our blessed mother Mary in Ephesus. My daily prayer is also essential to me. It provides me with the right frame of mind and spirit to receive the challenges and blessings of the day. What inspired you to launch a “Fast from Fast Food” during Lent this year? Interfaith Worker Justice believes that an honest day’s work deserves an honest day’s pay that’s enough to support your family. We wanted to find a way to support the fast food workers who are calling for fair wages that are in line with these values. Given that the Lenten season is nearly here, we felt it was a great opportunity to support the workers in a way that speaks to the nature of who we are as an organization through prayer, fasting and lifting up the moral imperative to treat workers fairly. In solidarity with fast food workers who are calling for $15 an hour and for better working conditions, we are asking people of all faith traditions to “Fast from Fast Food” over the Lenten season. While Lent can be a time of deep significance for many Christian traditions, we are asking people of any faith tradition to take a solidarity pledge to abstain from eating fast food from February 18 to April 5. The intention is to bring awareness and attention through an act of solidarity by prayer and fasting. It’s important that people understand that these two things go hand in hand. Someone once told me “fasting without prayer is just going hungry.” I couldn’t agree more, as I see the power of offering up our sacrifice for others as an act that deepens our connection to the suffering of our brothers and sisters. As an organization of people of faith, we find that the spiritual aspect of the “fast” is our most effective tool during this time. Fasting opens up a pathway to a spiritual power that has been known to shake prisons and swing open locked doors, as told in the story of the Philippian jailor in the book of Acts. I invite all your readers to join us in solidarity starting on Ash Wednesday. What are your hopes for this fast? We hope that through the Fast From Fast Food effort we can 1) bring greater national and local awareness to the plight of fast food workers and their struggle for fair pay and dignity in the workplace; 2) get more congregations and people of faith actively involved in advocating for just working conditions; 3) help those who participate grow in their personal prayer life; 4) raise the understanding of the importance of faith communities taking a stand and lifting up the moral side of social issues; 5) that this serves as a vehicle for fast food workers to develop their own leadership and prayer life; 6) and shift the national narrative on how we view and value low-wage workers and their contributions to our country. This is an important effort for us at IWJ and we see this as a potential model for other future efforts in the way we can offer a unique contribution. What do you hope people will take away from your life and work? That’s an important question because I believe we should all be asking ourselves that very thing. In many ways it speaks to another set of questions. Are we living out our purpose that God intended? How are we using our vocation to impact the lives of others? As Catholics I believe we are called to make the world a better place for all as we keep our eyes gazing towards heaven. It’s also important for me to acknowledge that my life doesn’t belong to me. It belongs to God and we only have this very short time on this earth. I’ve always felt that I’m accountable for how many people I’m helping to get to heaven. I can even picture our Lord asking, “My son, how many souls did you bring me?” That’s something I want to be able to be proud to answer someday. So my work and life, which are not my own, I offer up to our Lord and I pray that during my time I can make a difference in people’s lives and help them feel the love of God all around them even in places where it may be hard to see. I believe God is most present in some of our most challenged communities in this country, the ones struggling with poverty, violence and oppression. He is with us and loves us beyond measure, and I want my work and life to honor him. If people can see through my efforts the importance of their own, using that to make a difference and open their heart to God’s love, then I’ve done what I want to do. I see a day when no matter where you are from and what you do for a living, you are treated with respect and dignity. This hope is more than a matter of legislation or dollars and cents. It’s certainly much more than the politics that distract and discourage so many of us. My hope is really about fundamentally changing this country so that we aren’t afraid to live our values and so that we see the best in each other. Now I have no illusions that IWJ can do this all on its own, but with enough of us coming together, we can be the change we want to see.